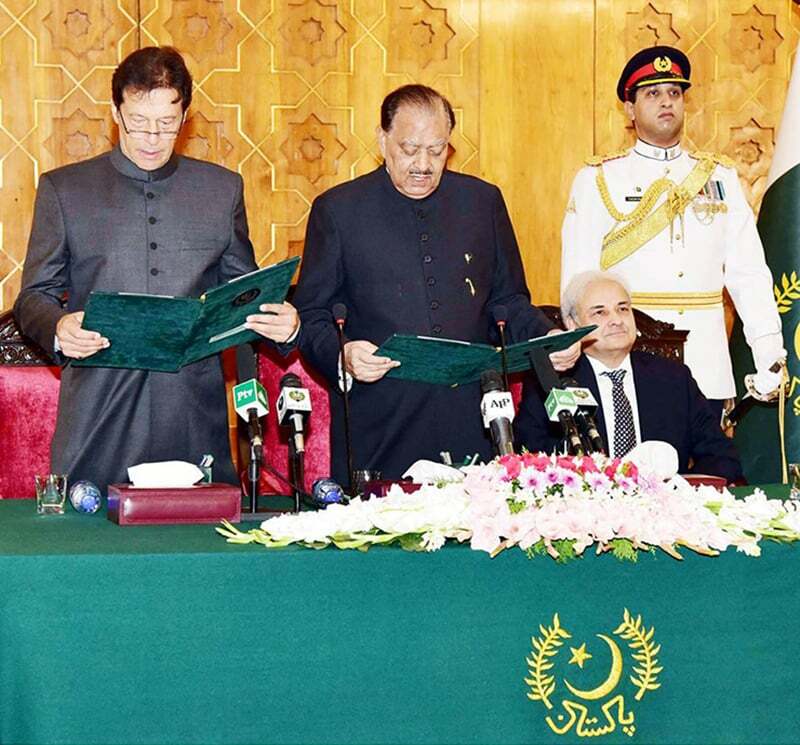 Imran Ahmed Khan Niazi was on Saturday sworn in as the 22nd prime minister of Pakistan in a simple ceremony hosted at the Aiwan-i-Sadr. The ceremony, scheduled to begin at 9:30am, started a little after 10am. The ceremony commenced with the playing of the national anthem, followed by a recitation from the Holy Quran. High-profile guests, including caretaker Prime Minister Nasirul Mulk, National Assembly Speaker Asad Qaiser, Army Chief Gen Qamar Javed Bajwa, Air Chief Marshal Mujahid Anwar Khan and Navy Chief Admiral Zafar Mahmood Abbasi, were present at the ceremony. Other notable guests included senior PTI leaders, cricketer-turned-commentator Rameez Raja, newly elected Punjab Assembly Speaker Chaudhry Pervez Elahi, singers Salman Ahmed and Abrarul Haq, actor Javaid Sheikh and former National Assembly speaker Dr Fehmida Mirza. A visibly overwhelmed Khan, clad in a traditional sherwani, smiled sheepishly as he had some difficulty with following the oath in Urdu. It was administered to him by President Mamnoon Hussain and televised live by state broadcaster PTV. After taking oath as premier, Khan and First Lady Bushra Imran greeted various guests and accepted felicitations from them. This was Bushra's first public appearance since their wedding earlier this year. As the swearing-in ceremony concluded, Khan was ushered to Prime Minister House, where he was presented a guard of honour by contingents from Pakistan's three armed forces. Khan had invited the rest of the 1992 team to the ceremony, and fast bowler Wasim Akram was pictured smiling among the crowd. Another cricketer-turned-politician, India's Navjot Singh Sidhu, was seated in the front row and was earlier warmly embraced by Gen Bajwa after an animated conversation between the two. The guests had been asked to carry their NIC or accreditation cards but not to bring with them any handbags, purses, mobiles phones or any other electronic gadgetry. According to a tweet by PTI's official Twitter account, the ceremony's menu of nine dishes was reduced to refreshments only on Khan's request as part of his "austerity drive".